I moved from London to Bristol 6 weeks ago. I work from home now - awesome but doesn't give me a lot of opportunity to get into town and see what's about. I did stop in a cafe the other day though as they were offering all sorts of 'free from' food. If you ever find yourself in Bristol, check out the cafe in the St Nicholas market. 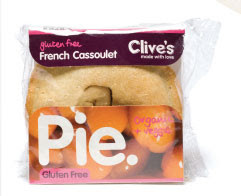 They sell a range of products from Clive's pies. I chose a French Cassoulet Pie (v) and a Passion cake. The cafe staff even warmed up the pie for me and I had it on a plate with lots of ketchup and chili sauce, lovely!The cake was to die for, more like a carrot cake with oodles of buttercream and chunks of passion fruit.